Supports Pale Moon [25.0a1pre - 28. *], Firefox [1.5 - 56. *], and SeaMonkey [2.0a1 - 2.48]. NOTICE: The Browser you're using may not be supported by TimerFox. If you believe this to be in error, please check your browser's User Agent settings. TimerFox is free software supported by donations, not advertisements. Since TimerFox's final release for Firefox in April of 2015, Mozilla has abandoned its own technologies in favor of poor parody of Google's protocols (WebExtensions), leaving many developers, including this one, disillusioned with the direction the Mozilla is taking. In contrast, Pale Moon has stepped into place as an XUL-centric browser, keeping backward compatibility better than Mozilla's own flagship project. So, for now, TimerFox may be considered a Pale Moon and SeaMonkey extension that still supports older versions of Firefox. 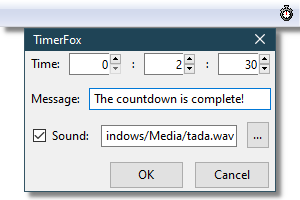 TimerFox is free for use or modification without limitation. However, it comes with no license, warranty, or guarantee of any kind. That being said, you can still ask any questions in the Comments section below, or contact me directly for assistance. What do you get if you multiply eight by seven?